Meet some of our passionate members from Vrindavan kitchen in Uttar Pradesh for whom the only aim is to benefit more and more children with freshly cooked, nutritious, and hygienic meals on every school day. I am working in Akshaya Patra since 30 June 2009. I always wanted to make a difference in the lives of others. And, I knew Akshaya Patra would give me that opportunity. Hence, I chose to join Akshaya Patra. Until I joined Akshaya Patra, I did not find peace and satisfaction in my job. But now life has changed totally and I feel blessed to be here in Vrindavan. 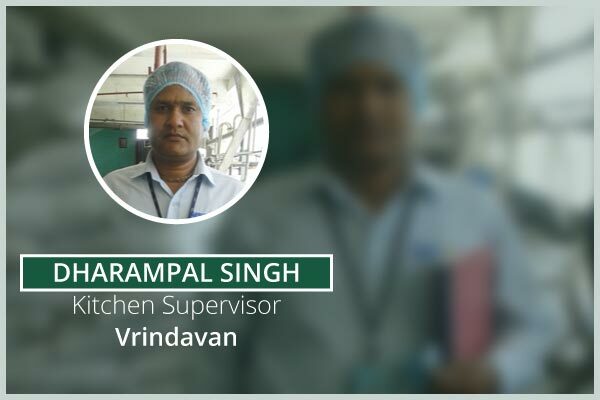 As a Kitchen Supervisor, my work encompasses taking case of the entire kitchen process and managing staff members. I ensure all kitchen staff mandatorily adhere to the personal hygiene standards and brief them on their respective responsibilities. I check the recipe summary sheet, raw material quality, monitor the cooking process, and taste food samples before delivery. I ensure that we always meet the ISO standards in our production process. Hygiene is an important factor, more so, when food is being cooked for school-going children. This food affects their personal growth and career development. Children are the future of our country, and we always keep their health and safety in mind while cooking food for them. My life has changed for the better after joining Akshaya Patra. It feels like a family as if all the employees here are threaded together with the idea of providing the best quality food to children punctually on every school day. It’s a great environment to work here. Sometimes it gets hectic, but when the food gets prepared and distributed to children I feel so proud. Each day ends with the satisfaction that I was able to serve the children. I want to continuing working for children through Akshaya Patra, for the rest of my life. I have been working in Akshaya Patra since last 9 years. Prior to joining Akshaya Patra, I faced lot of difficult conditions and life wasn’t really great. Describe your typical day as a driver. 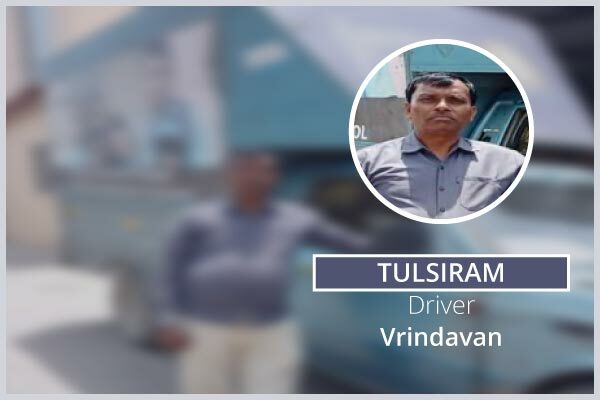 The days for me are quite difficult and hectic as a driver because the roads connecting the schools are not good. The schools are very far from Akshaya Patra kitchen. But, we make to reach on time and deliver the nutritious meals to school children. Despite the hurdles faced, it fills me with a sense of positivity that I was able to deliver the meals to children. Any specific problem you face while on your way to deliver meals. Mostly during rainy season, the roads get damaged. And, this poses a big challenge for us when we are out for delivering meals. Why is it important that food reaches children on time? Food is essential for mental and physical development of children. It is also vital in helping children to pay attention in class. Hence, I feel it is very important that children receive their lunch on time. It will improve their learning thereby benefiting them and the country also. I know the value of time! Alongside improving my life and routine, Akshaya Patra’s job gives me a sense of peace, satisfaction, and pride. Well, behind every great show, there are behind-the-scenes contributors. And, at Akshaya Patra, those contributors are our very own kitchen staff. Watch out this space to meet our passionate members from across all locations of Akshaya Patra. We would love to hear from you, so please use the below comment section to share your thoughts and feedback.